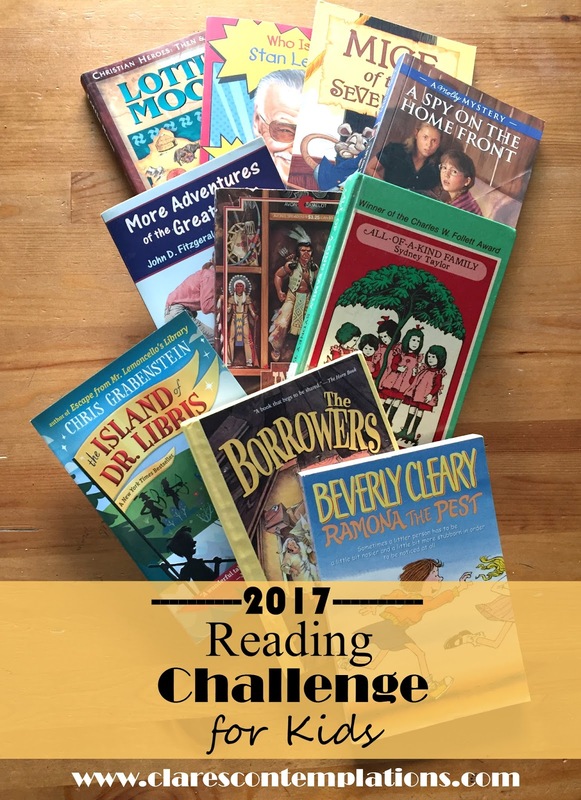 Last year I created a reading challenge for kids. It was so successful I decided to make another this year. 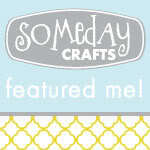 (It was even featured over at Money Saving Mom!) I created a printable to make it easy to keep track of your child's progress. There were a few questions last time around, so I thought I would try to cover some of the answers here. Let me know if you have anything else! Q. 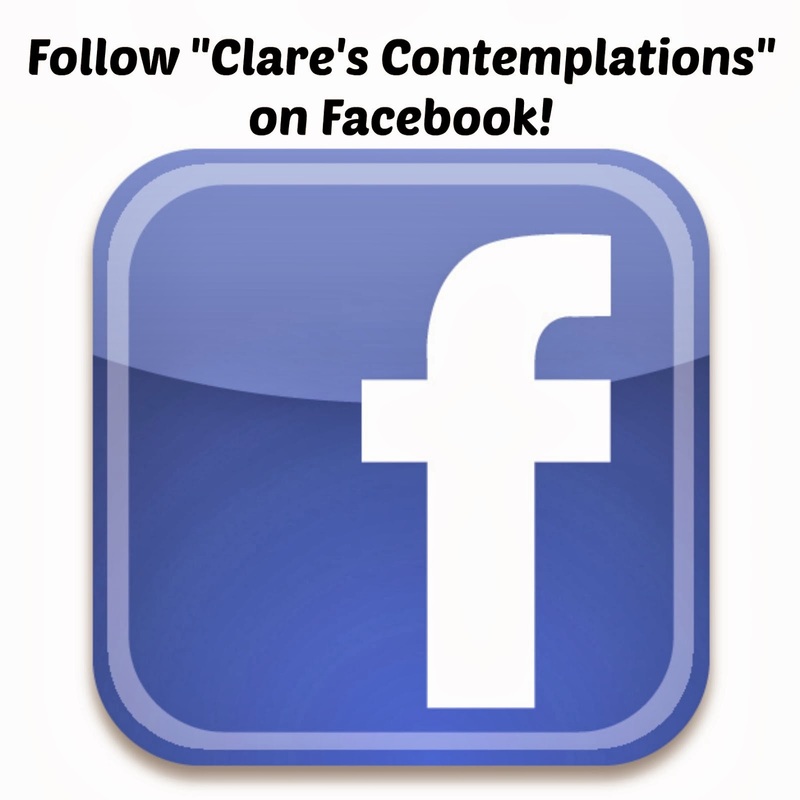 Should I use specific books? A. Nope! I tried to choose reasonably broad categories, and you can adapt them as you see fit for your family. Nobody will fine you if you don't use it the same way as somebody else. ;) I did *not* create this with certain titles in mind. I don't have a list, and sometimes we picked books based on the categories and sometimes we read books and then found categories they fit into. Q. Where can I find books for the challenge? A. Anywhere you want! Your own shelves, the library, the thrift store, the neighbor, Amazon... Just don't steal them! Q. How long should the challenge take? A. As long as you want. If your child reads one book per category, there is a total of 20. You can spread it out over a year, just work until they finish the list, or if your child is a fast reader, set a shorter amount of time! Make it challenging, but not overwhelming. Q. Can I read to my child? A. Sure! 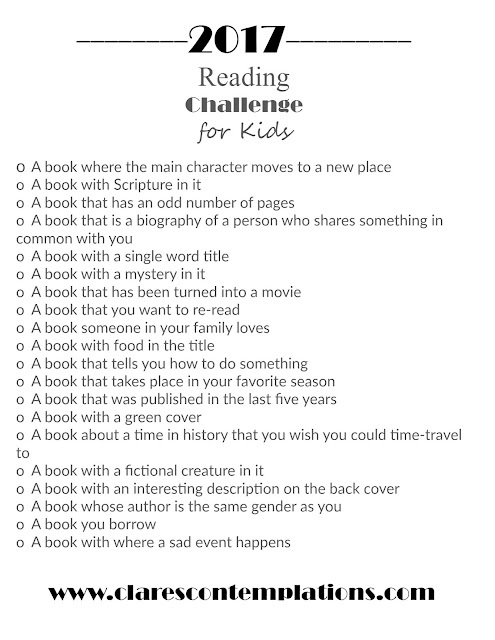 If you aren't catching on already, I really just wanted this challenge to be a jumping-off point, a catalyst to encourage kids to read a greater variety of books. If your child isn't a strong reader, or prefers to be read to, or you just want to share books together, feel free to read to them. Or mix it up and read some aloud, and have them read others independently. Q. Should I offer rewards? If so, what kind? A. You can consider that reading is its own reward, or you can use some "motivational tools". You can offer a small monetary amount for each title, you can offer candy or some other small treat,or even screen time! Or you could offer a new book at the end, or movie tickets, or a specified amount of money. Pick something that motivates your child! Please just don't make it drudgery or your child will curse me. Q. What is the best age to use this? A. For independent work, I suggest 8 to 12. For strong readers, you can definitely go younger. If you plan to work with your child you could probably even do 4 or 5, although I doubt they will appreciate the concept of a list. If you use it with a very young child just use it to choose titles yourself. This is all about what works best for you. If it encourages your family to enjoy exploring books, or helps your child to read a few extra words this coming year, it was all worth it. If you don't like this list, then feel free to use last year's if you haven't already! You will have the most success if you print the challenge from this link. Have fun and happy reading! Just printed one of these out for Aidan! I think he will enjoy the variety! :) Thanks friend. Great idea! I've printed out the list and plan to use it with my 9 and 6 year olds. Thanks!